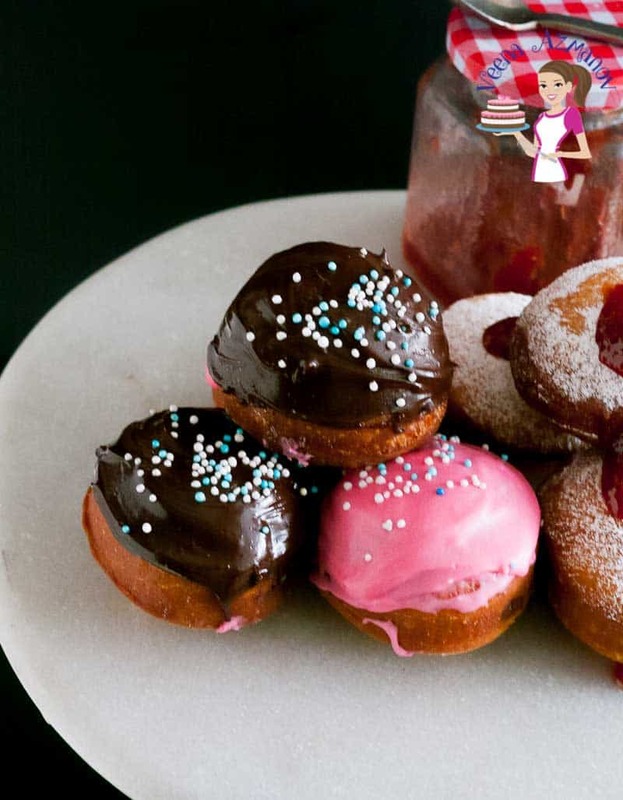 These deep-fried doughnuts are an addictive treat during the Jewish festival for Hanukah. 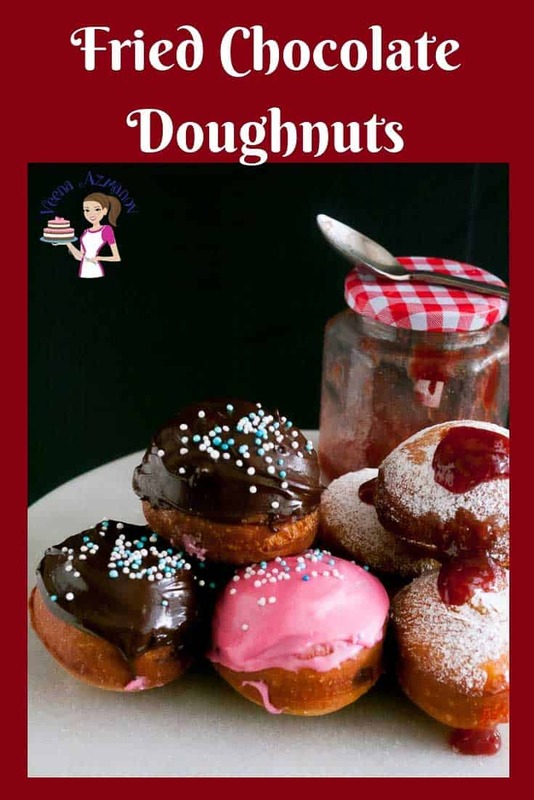 These glazed chocolate doughnuts are a twist on the traditional doughnuts that are filled with jam and dusted with powdered sugar. These chocolate glazed doughnuts decorated with sprinkles are very popular with the kids. Last year, I shared with you my Jam doughnuts. These are traditionally made during the Jewish festival of Hanukah. When I make the jam doughnuts I also make these glazed chocolate doughnuts. During the rest of the year, we make the ring-shaped donuts with sprinkles or cinnamon sugar and of course when fall sets in we have to make pumpkin doughnuts. So many choices but you know. DONUTs! You can never have enough of these. These Hanukkah doughnuts are much easier than the ring-shaped donuts. I think these are probably the easiest doughnuts I have ever made. 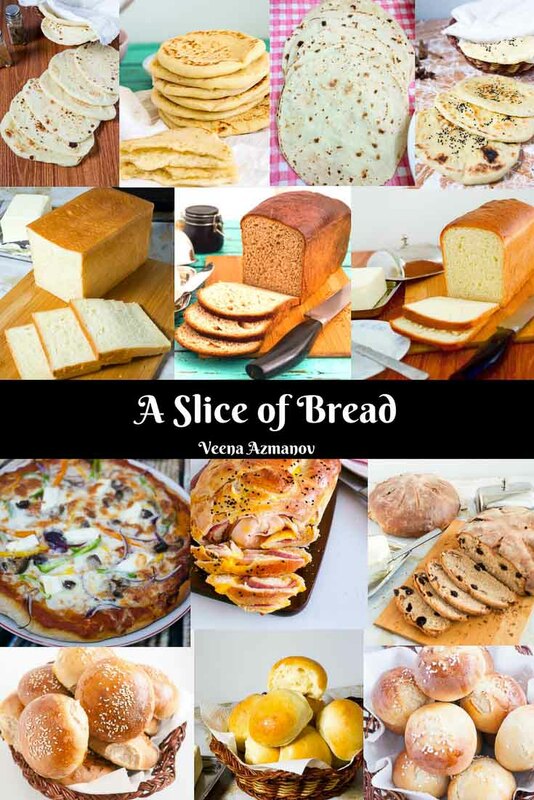 The dough is fairly simple, and easy. Once proved you divide and shape them into balls like you would dinner rolls. Once proved again all you do is deep fry this delicious treats. Fill them jam or glaze them with chocolate. You can also keep them simple with a generous dusting of powdered sugar. Told you it was easier than any doughnuts you’ve ever made. Liquid – I always use milk I think it adds so much more flavor. Having said that originally water is used for two reasons. It’s more kosher so the presence of milk does not conflict with food. Second, the milk solids when cooked in hot oil tend to make them darker; so you have to be extra careful when frying them. I still have always used milk. Oil – you can use peanut oil, sunflower oil or canola oil. I always use canola oil. Do not use olive oil as it has a strong flavor. You want to use any oil that is good for deep frying and has no flavor. 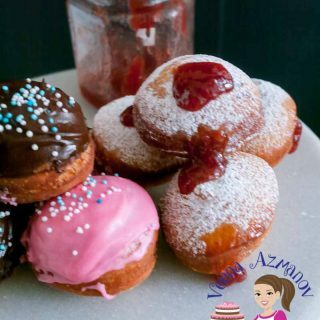 Instant dry yeast – I always use instant dry yeast but you are welcome to use fresh yeast as well – For this recipe, you will need 30 grams of fresh yeast. 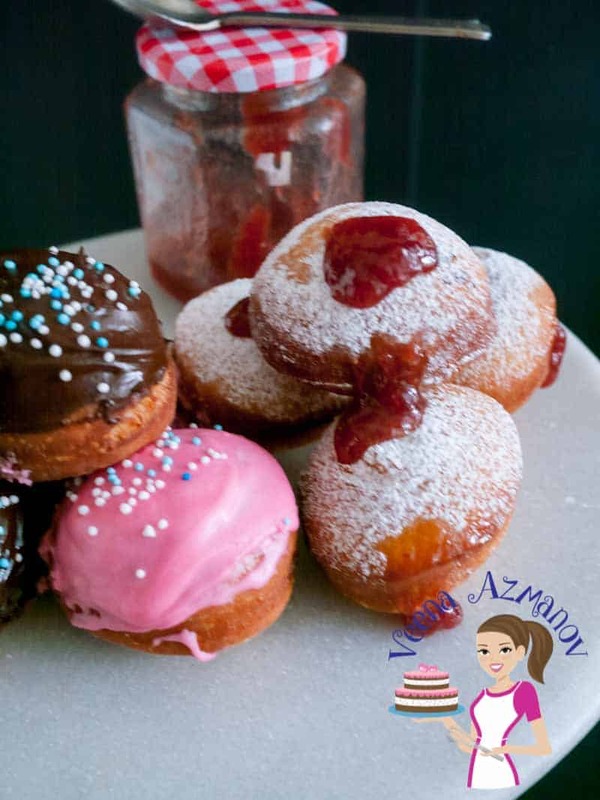 All-Purpose Flour – You can use bread flour and the doughnuts will be lighter but not necessary. I have always used all-purpose flour and that’s works perfectly for me. Chocolate – I like to use dark chocolate but if making these for kids semi-sweet chocolate would be perfect. In a cup or bowl – add warm milk, yeast, and one tablespoon sugar. When formed up (about 3 to 5 mins) – add the egg, remaining sugar and vanilla. Add flour and salt – mix to combine. Once all the flour is mixed in – knead for 2 minutes on medium-low speed (or with your hands for 5 minutes). Once double in volume and chilled – invert on a floured surface. Divide the dough into 14 to 16 portions – (roll into a log then cut the log in half, then half again until you have 14 to 16 portions). Once all the balls are rolled – press with your palm on top of each to flatten it slightly. This will make sure it becomes a doughnut shape rather than a ball shape. 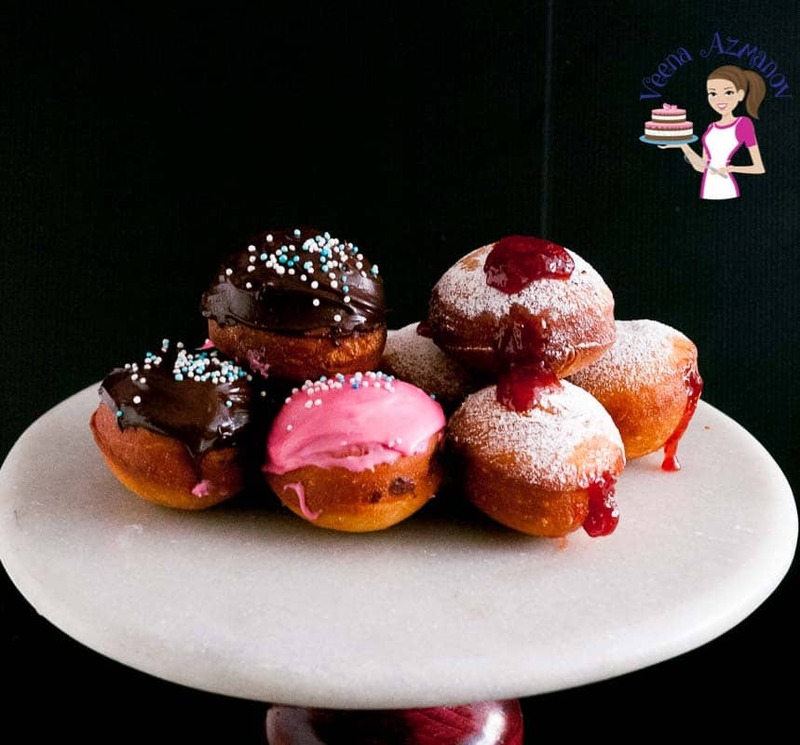 Tip – Always make one or two mini doughnuts for the purpose of testing oil temperature. Tip – ideally, you want the oil hot but not so it will brow the doughnut instantly. These need to be cooked thru before they brown. Once the oil is ready – add two or three doughnuts at a time. Decorate with sprinkles before the chocolate sets. Chop chocolate into smaller pieces. Combine the cream and chocolate together in a microwave safe bowl. 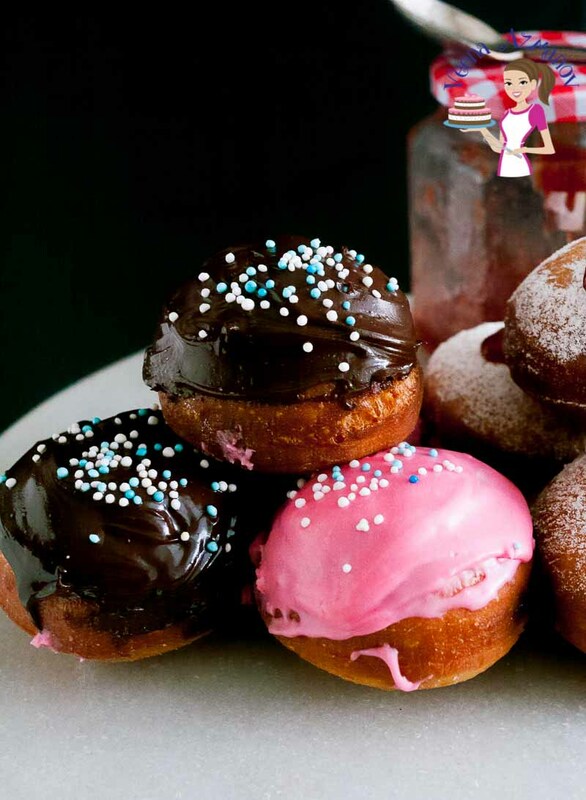 Dip the top of each doughnut into the chocolate glaze. 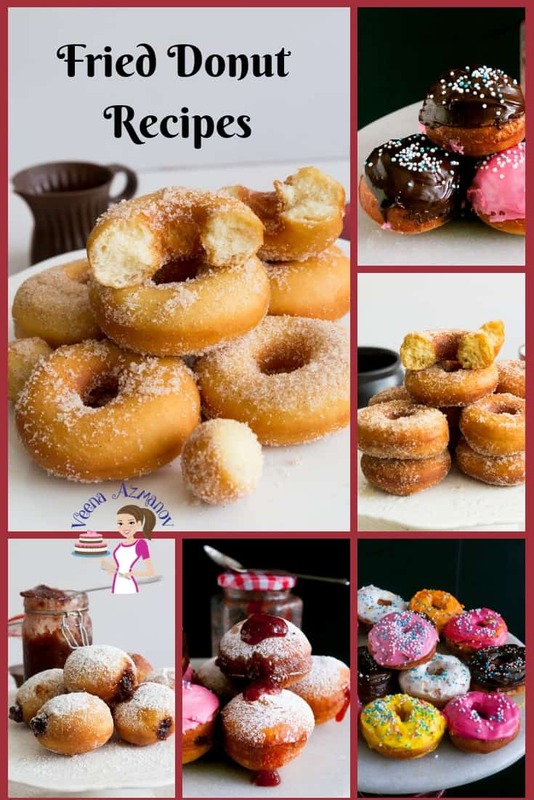 Jam Doughnuts, Chocolate Doughnuts, Cinnamon Sugar Donuts, Pumpkin Donuts, Baked mini donuts. Oh these look SO good. 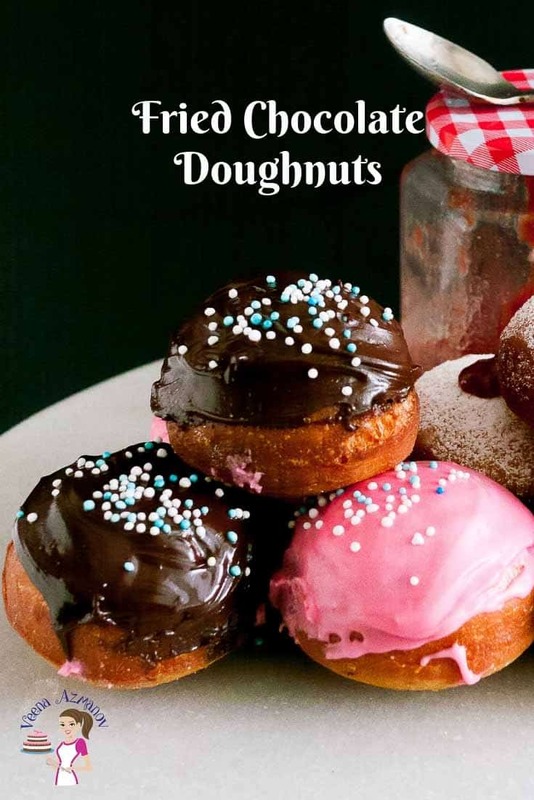 I have always wanted to try making my own donuts and I am definitely going to have to try these first. Thank you, Danielle. I hope you do. Ha… I know what you mean. I’ve had one too many donuts over the years too. Thanks, Danielle. These are so easy. You can never have enough doughnuts! These look amazing and I’m not surprised the kids love these. I love that chocolate glaze! I REALLY want to try making my own donuts but my lack of fryer has always put me off. I see you can use a large pan of oil thanks to your post so I’m going to try this, thanks! Hey Amy. I use to have a fryer but never ever used it so had to give it away. I’m just old school so I like using my pan with oil.